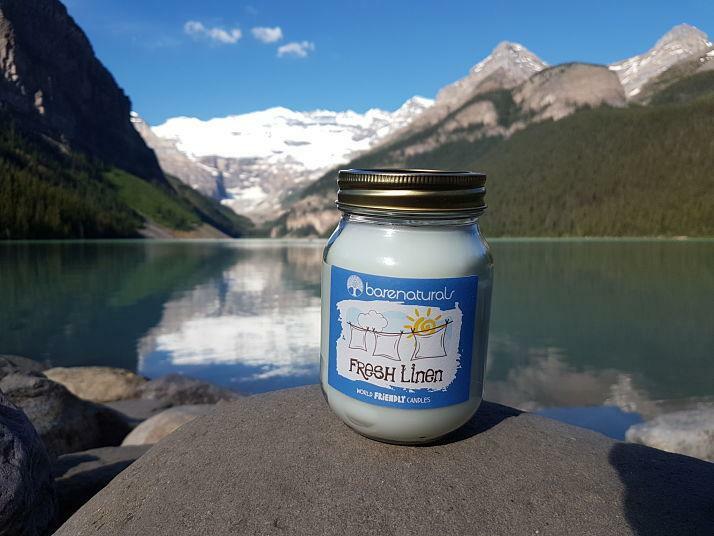 Barenaturals is an award-winning company that sells hand-made, natural products including candles and cosmetics. They have a strong sustainable ethos and are now planting ten trees for every candle sold. The Co-Founder & CEO, Darcey Croft, is also a midwife and runs the business from the home she shares with her partner and children. What brought you to the world of candles and skincare? Originally it was my dissertation at University. I was researching the effects that endocrine disruptors, (chemicals that mimic hormones in our bodies) in skincare had on unborn embryos. The negative long term effects these have are powerful and life changing. It was this research that first got me interested in natural skincare. And, while still at uni, I started making and selling organic skin care products. But it got so hectic with coursework, my hospital placement and the stresses of being a student midwife with a young family, that my partner David came to the rescue and we evolved the little side project into Barenaturals. Candles didn’t come until 2016 - I love the symbolism behind candles, the light and love they shine and they’ve fast become our core product line. How do you make your products? We have a tiny workshop out the back of our home. In fact the family home has been kind of taken over by the business, it has its benefits but means I rarely get away from the business and my ever patient children get an early introduction to sustainable entrepreneurship. We source the ingredients from ethical, usually small independent businesses here in the UK and try to get as local as possible. The candles are produced in small batches by hand. We only use plant-based waxes and oils, the place always smells incredible. Then when the candles are ready all the labels are applied by hand and packaged up ready for Amazon, wholesale and online orders. What kind of measures do you take to ensure your products are sustainable? Everything in them comes from a renewable and non-animal-derived source. We buy local where possible to limit the carbon footprint. We ensure the packaging comes from sustainable sources and desperately try to not use plastic. Although transporting glass jars through the post means we still have to use special air packed plastic protection. Even though it is recyclable it’s not perfect and we are always searching for better alternatives. It is clear you have a mission to respond to ecological breakdown. How serious do you think the situation is? I think the situation is beyond serious. Anyone who is living in the areas affected by ecological breakdown knows how quickly economical breakdown follows and the devastation to local communities this causes. The trouble with knowing is that it is easy to assume that everyone else is aware too. But so long as people are glued to reality shows, fed fast cheap food and pushed the celebrity culture of greed, shame and worthlessness, it’s going to be an uphill struggle to get across just how serious things have become. I mean if the oceans die we die, and that’s not just a nifty saying by Captain Paul Watson. The plankton make most of our air, more than even trees and we have thrown so much pollution into the ocean it’s suffocating, some parts of the Great Barrier reef are officially dead already. We have made so many wondrous creatures extinct through deforestation and poaching. Animals like giraffes, elephant and tigers, to name a tiny but well know few, all are jaw-droppingly close to extinction. On top of this is human and animal welfare issues, like the increase in disease, poverty and abuse of the vulnerable can be attributed to failing local resources, large scale industrial meat production and manipulation by greedy uncaring corporations. Yes I think we do have a serious problem. How do you build a brand around a mission? Barenaturals was brought to light because both David and I, saw a devastating dent in the universe that we humans have created. Such as the ecological breakdown mentioned before and deforestation that causes poverty to families and endangers wildlife to the brink of extinction. We decided that Barenaturals would exist for the purpose of positive impact and become a beacon for sustainable business. We would achieve this by planting ten trees for each candle sold. This small action empowers our customers to become activists directly through their own purchase choices. Because, our individual choices when used collectively for the good of people, animals and environment will change the world much faster than law. Positive impact through consumerism is the way forward. [caption id="attachment_10158" align="aligncenter" width="714"] A Barenatural product[/caption] Why is tree planting so important to you? Growing up on the edge of an ancient forest I’ve always been pretty fond of trees - especially really old ones. Not to sound too crazy but they have an ancient magical feel about them and I love the strength and peace I feel when I’m around these old growth trees. On a more practical level, trees are more important than many people give them credit for. From providing oxygen, sequestering carbon dioxide to regulating climate that the rest of us massively benefit from, for example who doesn’t enjoy breathing? The trees provide homes for abundance of species and many of the endangered species in the world are only endangered through loss of habitat through human actions. The leaves, bark and felled trees replenish soil with nutrients so other plant life and healthy food can grow. Water is controlled by the roots, tethering soil so it doesn’t wash or blow away. This controls flooding and desertification of land. A little known fact about trees is that they can determine when to procreate. They can hold back their seeds for a couple of years if the conditions for success are not available. For example, a year when beech nuts are abundant, this causes a rise in foraging animals, who feast on the nuts and successfully raise well fed offspring. The tree saplings suffer and perish and conditions for successful tree raising become poor. The mother tree (this is an actual term) senses this and withholds her seeds until the forager population decreases through lack of food. In the following year (or two) or when conditions are better, the tree makes a comeback producing an abundance of seeds and nuts again to ensure success for her little saplings. This is just one example of how the amazing and largely forgotten interconnectedness that trees have with their environment and the integral part they play in the cycle of life. To use trees, only as expendable consumer commodities, to the point that air, land and life are negatively impacted is sheer craziness. On a humanitarian level, trees are used in areas of poverty for survival. We can’t apportion blame to people with families to feed and keep warm who have no choice. If trees provide cooking fuel or money where there are no other options, then of course you would chop down that tree. But environmental blight overtime becomes economic blight. Nutrient poor soil causes farms to fail, livestock and crops perish and many farmers have no option but to move to overcrowded cities to look for work. Often they resort to selling themselves or their children into slavery just to survive. We partner with the Eden reforestation project and the funds from our candles are part of the direct action to improve humanitarian issues. The project starts by providing jobs and resources for the local community. Like boats for planting in the Malagasy Mangrove Swamps. Jobs, like working in the tree nursery or as guardians protecting the young trees from animals. The project directly empowers the locals through the dignity of work to grow and nurture their own forests and correct the negative effects of deforestation. Wages from these jobs have released families from slavery and the vicious cycle of poverty. And, when people have grown a forest from the root up they are more inclined to love and protect it. How many trees have you planted and who does the planting? What is your target? We started our tree planting project November 2016. Since then we have supported our planting partner the Eden Reforestation Project to plant thousands of trees. However our target is 10 million so we still have a way to go! What is the World Friendly Foundation? This is a non profit organisation that we have set up to boost the tree planting numbers. It’s still early stage but my plan is to certify and promote products and services from businesses that contribute to conscious consumerism and positive impact. The proceeds from these contributions will boost species conservation and reforestation efforts. What are your plans for the future? To grow brand awareness for Barenaturals and the World Friendly Foundation. This will help us to reach our 10 million trees goal far sooner. So anyone reading this - if you can help us share this article it will be really appreciated. What is the advice you give young people who want to make a difference? To start thinking about their day-to-day choices and how these choices make a difference. From waking up and maybe choosing to not stare straight away at social media, or what you eat, what you buy. Everything is connected by cause and effect and the direct action of your choice will inspire butterfly effects either positive or negative. For example by choosing and discouraging others NOT to visit captive dolphin shows, the less ticket sales, the less demand to kidnap and kill entire family pods of wild free dolphins, in Taiji, Japan - an area that supplies the captive dolphin industry. Choice is direct action in simple and yet a most powerful form like buying a positive impact product like a Barenaturals candle will cause ten trees to be planted and alleviate poverty in areas of deforestation. What gives you hope? A recent BBC study reported that one in five people in the UK would consider becoming Vegan for either health or animal welfare issues. This change in attitude is immense and young people are far more aware of the massive positive impact to their own health and to the sustainability of resources than ever before. This gives me hope - that dark archaic greedy profiteering is dying and being replaced by the light. I see more and more people thinking about what they are buying, who they buy it from, and how their choices help. I don’t think the behaviour is mainstream enough, not yet. But the fact that it isn’t an unusual or derided concept anymore gives me hope. People who stand up for ethical and environmental issues - whereas historically they were ridiculed as hippies (by people who didn’t like inconvenient truths), these eco-warriors are being elevated and taken seriously now. Because whatever your stance on issues like climate change, Ocean pollution, animal welfare, health, poverty, racing extinction etc. everyone with a modicum of intelligence knows that we are in deep trouble. And I am immensely grateful for all the folks, like the people who buy Barenaturals candles, who are standing up for these important battles.